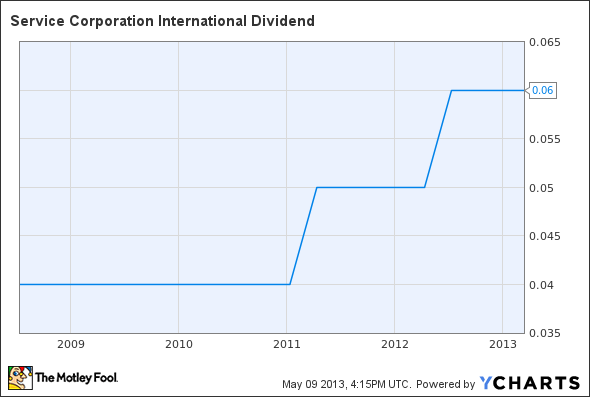 Death-care leader has increased the payout to investors several times since reinstating dividend in 2005. In a move to die for, death-care industry leader Service Corp International (NYSE:SCI) announced yesterday its second-quarter dividend would be increased 17%, to $0.07 per share, from the previous rate of $0.06 per share. The board of directors said the quarterly dividend is payable on June 28 to the holders of record at the close of business on June 14. Service Corp began paying dividends in 1987, but suspended them in 1999. It reinstated shareholder payouts in 2005, and has consistently paid them since, and raised them several time,s as well. The regular dividend payment equates to a $0.28-per-share annual dividend, yielding 1.7% based on the closing price of Service Corp International's stock on May 8.